T-Mobile just let us know that they are now pushing Nougat update for their Galaxy J7. The OTA update comes as software version J700TUVU3BQI5, and bumps the Android version on the device from Android 6.0.1 (Marshmallow) to Android 7.1.1 (Nougat). Oh, T-Mobile says it’s Android 7.0. But it’s not, as the update is available for download on the web already, bearing Android version 7.1.1, which is also in line with the latest Nougat updates from Samsung. The update carries the August security patch, so it doesn’t probably comes with Blueborne security patch fix. Bad! As we told you yesterday too, the official blog of Samsung Turkey revealed that the 8.0 update is in the works, and the target release date is early 2018 (can be taken as January 2018 release). No device for Oreo rollout was mentioned in the blog post, but you can safely assume it to be the Galaxy S8, along with the S8+. The Galaxy Note 8 Oreo seems next in the pipeline, but it could be February 2018 when we see the 8.0 OTA rolling out for the device. Read more about Samsung Android 8.0 update plans here. Note: Please note that is not the Galaxy J7 Prime handset that was already launched on Nougat (7.0), recently. We’re yet to see T-Mobile roll out first update for the J7 Prime. The J7 receiving Nougat update (7.1.1) at T-Mobile is an old one, carrying the model no. SM-J700T. The Nougat update is being rolled out in phased manner, so be patient if you don’t see the update today, or within next few days as it should hit your device surely within few weeks. You can try to force your device to download the OTA manually, and for that, try the ‘check for update’ button in System updates section under Settings. 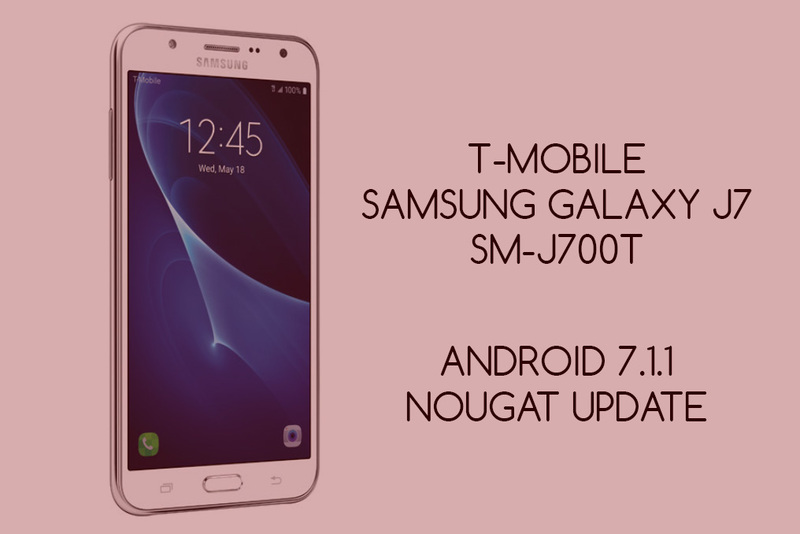 Use the link of the T-Mobile J7 Nougat update build J700TUVU3BQI5 given above, and download it on your PC to install it yourself, without the need of an OTA update from T-Mobile or Samsung. (Link is also available on our J7 update page here). For help with installation, check out the Samsung Firmware installation page of ours.